« Will You Make a Difference on World Water Day? We see the strength of women everywhere, in our families and extended families, but then there are those women warriors who take on fierce battles with far-reaching implications for other people, communities and resources. March is Women’s History Month, and Partnership With Native Americans is taking the opportunity to honor three women whose influence has contributed to the greater good, breaking barriers to improve the lives of Native Americans and improve social equity in the U.S.
Elouise Cobell (Blackfeet): A tireless leader of social and economic equity, Elouise Cobell achieved many significant milestones during her lifetime, including chairing the first national bank located on an Indian reservation. A contemplative “I can’t do it” echoed by a friend was the call to action that encouraged Cobell to finish what she says “started in 1887” when Congress authorized the General Allotment Act (aka Dawes Act). This made Cobell the lead plaintiff in the largest class action suit brought against the U.S. government, which tribes across the country would come to know as the Cobell Settlement. Filing this historic suit on June 10, 1996, Cobell’s motivation was simple—to right an egregious wrong and ensure restitution of funds owed to more than 300,000 individual Native Americans in relation to their land allotments and sale or lease of the land for grazing, gas and oil production, coal production and other purposes. The Cobell suit, started during the first George Bush administration, finally came to closure 15 years later under the Obama administration. Nearly a year after that, Native Americans began receiving their settlement checks and accounting of the federal government was changed going forward. 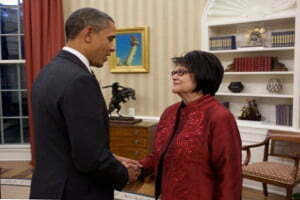 Cobell succumbed to cancer just months after the settlement was approved. This passionate knowledge grounds her work with the White Earth Land Recovery Project, where she works against the genetic engineering of seeds and plants, and for the protection of Native seeds and heritage crops to ensure healthier food sources for her people. 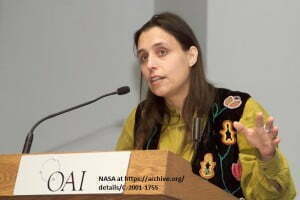 A lifelong environmental activist, Winona LaDuke was honored by “TIME” magazine as “one of America’s fifty most promising leaders under forty” and named “Woman of the Year” by Ms. Magazine for her work with Honor the Earth. She has also supported the Environmental Program at the Seventh Generation Fund as well as the Women’s Earth and Climate Action Network. LaDuke also co-chaired the Indigenous Women’s Network and worked with Women of All Red Nations to raise awareness about the high rate of forced sterilization among Native American women. 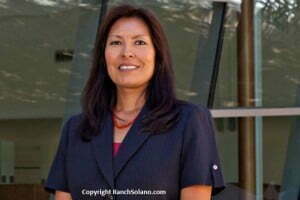 Diane Humetewa (Hopi): This Native American woman has a track record of “firsts” in U.S. history. From 1993 to 1996, Diane Humetewa served on the U.S. Senate Committee on Indian Affairs. She served for five years as a judge for the Hopi Tribe Appellate Court and also taught law at Sandra Day O’Connor Law School at Arizona State University. Humetewa is the First Native American woman to serve as a Supreme Court justice and the only American Indian in the federal judiciary. In 2007, Diane Humetewa became the first Native American woman ever to be appointed U.S. Attorney, serving in her home state of Arizona. It wasn’t two years into her appointment that she resigned the position, following a Presidential election. Her departure was an unpopular choice, given the under-representation of women and particularly Native women serving in this capacity. Yet, as a first generation college graduate, Diane Humetewa knew early on that regardless of title or position, she would always be an advocate for tribal nations. So, it was not surprising when, in 2014, she was re-nominated to the elevated position of Federal Judge and unanimously confirmed by the Arizona Senate. Growing up in both reservation and urban areas of Arizona, Humetewa is the perfect complement to a judiciary system serving 22 federally recognized tribal nations in the state of Arizona. This entry was posted in Humanitarian and tagged economic equity, Native American, social equity, tribal leaders, tribal nations, women's history. Bookmark the permalink. Trackbacks are closed, but you can post a comment.